In a glamorous Newport mansion filled with secrets, a debonair lawyer must separate truth from deception. . . .
Spring 1921. The Great War is over, Prohibition is in full swing, the Great Depression is still years away. Wealthy families flock to the glittering "summer cottages" they built in Newport, Rhode Island. Having sheltered in Newport during his misspent youth, attorney Adrian de la Noye is no stranger to the city. Though he'd prefer to forget the place, he returns to revise the will of a well-heeled client. Bennett Chapman's offspring have the usual concerns about their father's much-younger fiancée. But when they learn of the old widower's firm belief that his late first wife, who "communicates" via séance, has chosen the stunning Catharine Walsh for him, they're shocked. And for Adrian, encountering Catharine in the last place he saw her decades ago proves to be a far greater surprise. Adrian is here to handle a will, and he intends to do so—just as soon as he unearths every last secret about the Chapmans, Catharine Walsh . . . and his own very fraught history. Newport combines several fiction elements that I love: historical detail, a 1920's setting, a compelling mystery, and a love story (or two). This is one of the new releases that I have looked forward to most, and it far exceeded my expectations. First, there is the setting. Liriodendron, the "summer cottage" in Newport, was spectacular and atmospheric. In my mind's eye, I pictured Rosecliff in Newport, which served as Jay Gatsby's mansion in the 1974 film The Great Gatsby. Then there are the period details. The 1920's is one of my favorite period settings, and the details were fascinating, right down to the clothes the characters wore. Then of course, there are the characters. The protagonist is the strong, handsome, and mysterious Adrian de la Noye. When he visits Liriodendron in Newport to help an older client with his plans for a wedding and revised will, he meets the man's younger fiance. Catharine Walsh is a face out of his past. This is a book with many plot turns and twists. There is an involved story about spiritualism, which was popular in the 1920's. The depictions of the seances were eerie. I stayed up late two nights in a row because I could not put this book down! There are so many twists in this book that to say more about the plot would be to share spoilers, and I will not do that. 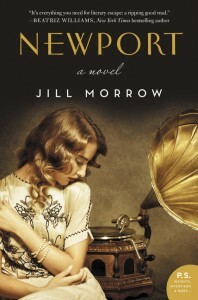 I will just say this: if you love well written, atmospheric historical fiction, the 1920's, ghost stories, romantic stories, or just a wonderful read, then Newport is a book you will love. I know I did. Jill Morrow has enjoyed a wide spectrum of careers, from practicing law to singing with local bands. 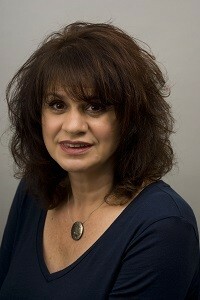 She holds a bachelor's degree in history from Towson University and a JD from the University of Baltimore School of Law. She lives in Baltimore. Find out more about Jill at her website, and connect with her on Facebook and Twitter. The 1920s is a favorite time period of mine as well! Sounds like this book has elements that would appeal to a lot of readers. The 1920s was such a jazzy age. I love the sound of this book. Great Gasby was a favorite read of mine. Thanks for sharing on Literacy Musing Mondays.